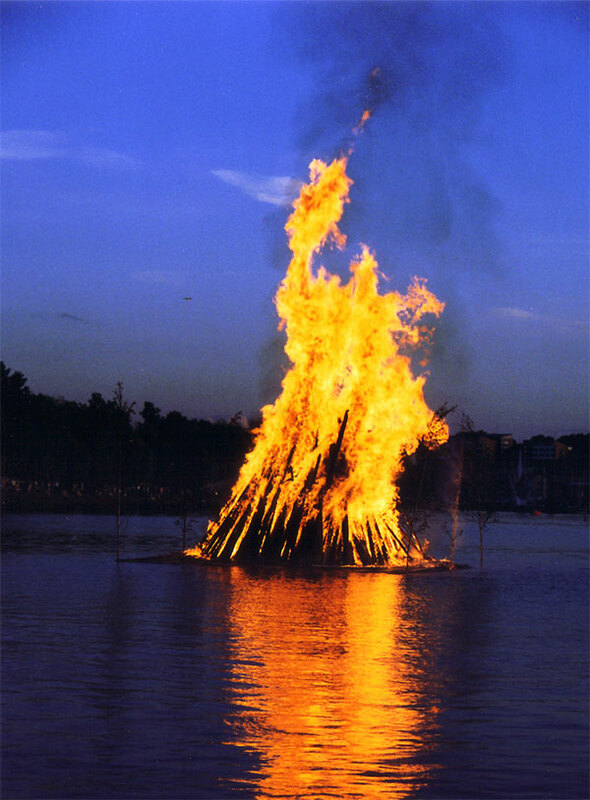 Midsummer bonfire in Lappeenranta, Finland. Photo by Petritap. Midsummer’s Eve – the longest day of the year – is celebrated in dozens of countries with huge bonfires, maypole dancing, and glorious food. In Scandinavia, the sun never fully sets. But even if night falls where you live, you can still celebrate. 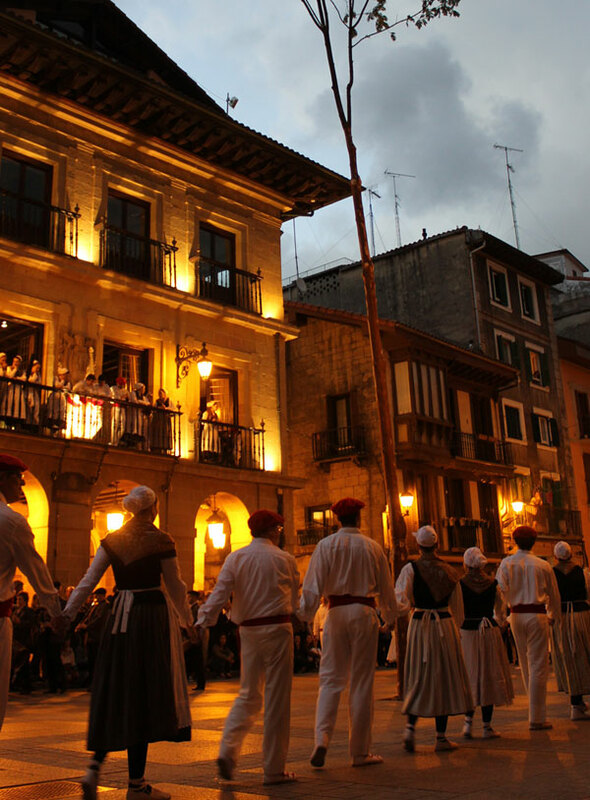 Midsummer festival in Errenteria (Basque Country). Photo by Beñat Irasuegi. To get into the spirit, simply drop out of big city chaos and into nature. This is a time to make flower crowns, swim in clear streams, sing hymns, and laugh more than is wise. 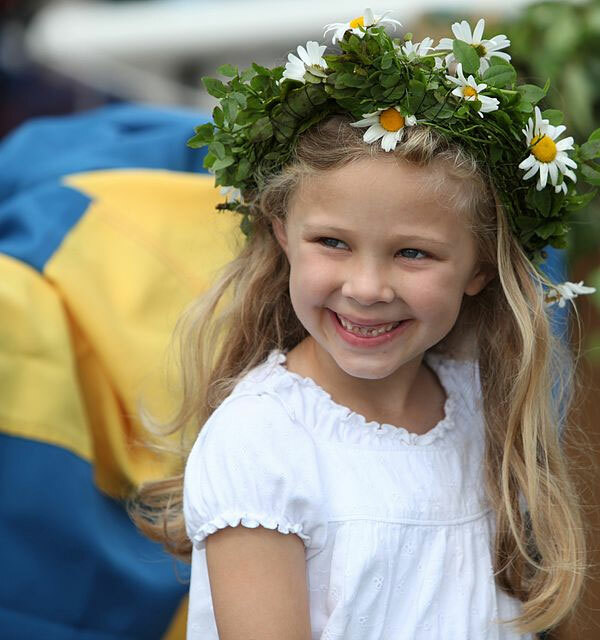 Swedish girl wearing a Midsummer crown. Photo by Bengt Nyman. Some say Midsummer is also a time for love. After long, dark winter the cheerful sun naturally warms hearts. One famous Swedish proverb states: “Midsummer Night is not long but it sets many cradles rocking.” It is also said that, if a woman is to pick seven flowers in silence and places them under her pillow on Midsummer Night, she will dream about her one true love. For me – already fully in love and married with a child – the main purpose of Midsummer is to enjoy the light with my family. Camping is a fantastic way to do this. After all, every time I camp, I stay up late and wake up with the birds. 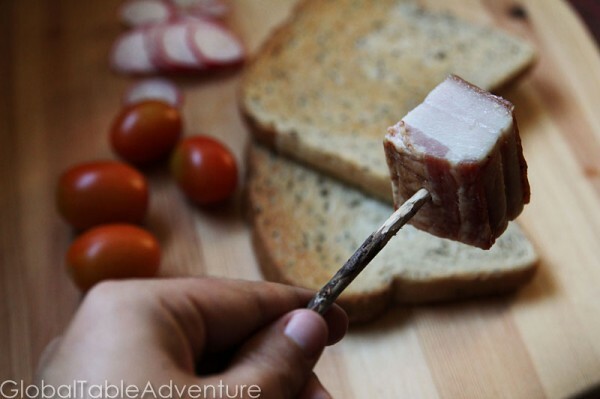 With this in mind, I’ve gathered some of my favorite campfire foods from around the world… though not exactly traditional, these foods would be perfect for any Midsummer’s campfire celebration. Get ready to sit and chat the night away: this Hungarian favorite includes large cuts of bacon rendered slowly over a campfire. The drippings fall on slices of rye bread, which is then enjoyed with gusto. The crispy bits get added to salad. Try it and soon you’ll be seeing stars. Nothing like making a cake on a campfire… especially if that cake looks like edible sunbeams. Flija is made layer by painstaking layer … by campers in Kosovo. Learn how (be sure to watch the video to discover exactly how folks in Kosovo make flija). 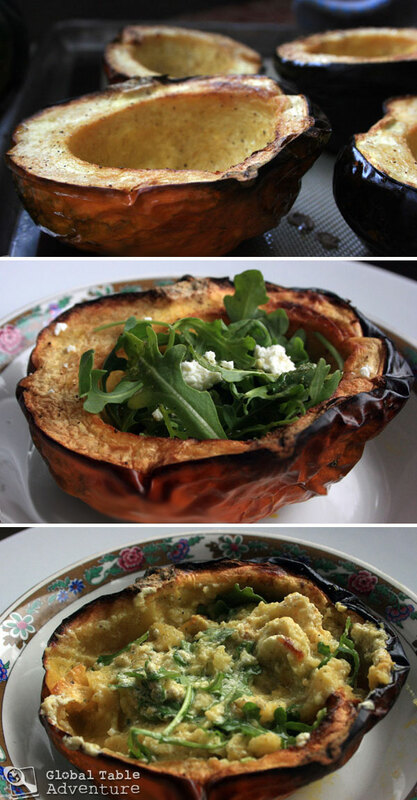 Take a hot, roasted squash and stuff it with arugula, aged goat cheese, and an oregano and mint dressing… mash it all together into a big, hot mess… and life is good. This recipe, inspired by the famous Argentinian chef Francis Mallman, uses a whole pumpkin that’s roasted in the embers. Yes. 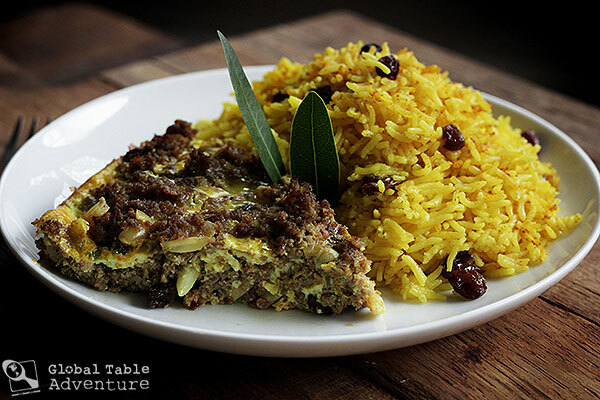 Traditionally cooked over campfires in South Africa, Bobotie is an explosion of flavor. Today, Bobotie is often cooked on an outdoor grill or in the oven… but don’t be afraid to whip out the cast iron skillet and make it campfire-style! Get ready for curry goodness with sweet chutney love! No Midsummer would be complete without a little bit of Sweden. 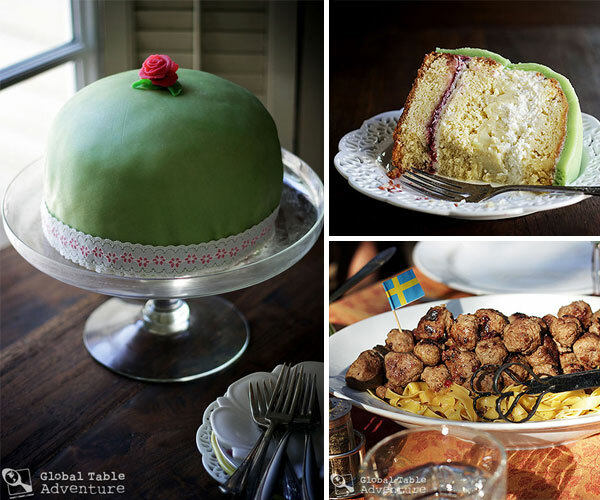 Perhaps a a bowl of Swedish Meatballs followed by a slice of Swedish Princess Cake (Prinsesstårta)? Yes, please. Forget everything you know … and go for some truly magical food. 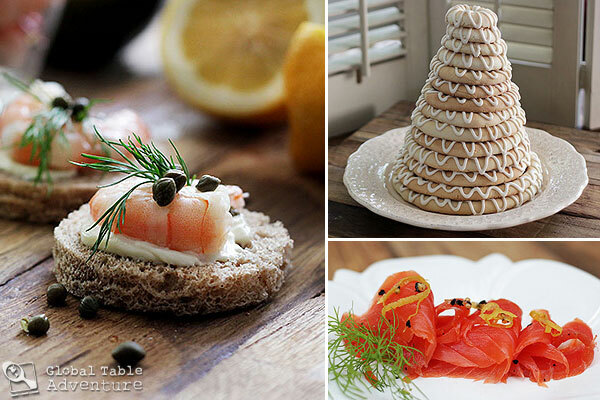 There’s nothing quite like a Scandinavian Ring Cake (Kransekake) , this lovely Norwegian Summer Shrimp Party, or a batch of homemade Dill & Lemon Pepper Gravlax. Okie Dokie! Enjoy some hearty Finnish fare this Midsummer’s Eve – like this Maple-Glazed Rutabaga, or a side of salmon topped with homemade Scandanavian Mustard & Dill Sauce. Wash it down with Finnish Blueberry Milk. Or just go for broke and live off a loaf of Cardamom Sweet Bread (Pulla). I could. Yes-sir-ee. We made some wintery treats back when we cooked Denmark, like this Mulled Wine (Gløgg)… but there’s also a nice, summery Smoked Salmon Smørrebrød, hearty Danish Meatballs (Frikadeller), and a simple Danish Apple Cake (Æblekage). Everything’s cold in Iceland – even these soups! Try Sweet Rye Bread Soup or this Tart Rhubarb Soup. Not in the mood? No problem – eat Rhubarb Raisins, or spoon a purple bowl of Blueberry Cardamom Ice Cream. Ahhh. Now that’s good! Thanks, Gwen! 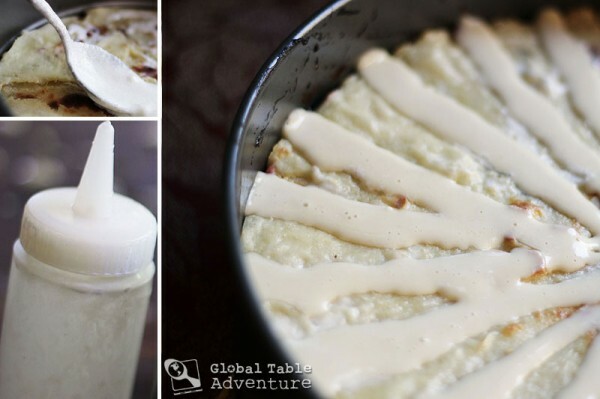 I’m enjoying putting together the compilation posts – good reminders of all the great food we’ve tried. My book will actually be a memoir – a very personal glimpse into my childhood and the circumstances that eventually led to starting this blog. There’ll be 29 recipes to go with the story… so something for everyone!